I've been furiously working on Mother Hand's cardigan. Last weekend I bit the bullet and cut the steek; this week I have finished the second sleeve and picked up and knitted the button band. The knitting part is finished now (in the nick of time, though not in time to send it for Mother's Day) - I just need to weave in ends, block and add buttons. And figure out what to do with my steek edges. In spite of my efforts at crochet, it has not held on the colourwork sections. Weirdly, it's fine where it's just plain knitting, but the ends on the colourwork sections began escaping almost immediately and caused me some issues when I was knitting the button band. In some cases I've pulled all the ends together in two bunches and felted them together with my fingers, but I don't really want to do that with all of them, because it some cases the ends are just about holding. I think I'm going to need to work out a way of sewing the ends over without it showing on the other side. Headache. BUT. At least I have attempted a steek and the v neck came out fine. Not really anywhere this week, but last weekend I went to Sheffield to catch up with Jen and speak at a conference. Jen is moving to Edinburgh very soon so it's probably the last time I'll see her in Sheffield. We went to a Take That tribute with a three course meal. It was...an experience. They weren't very good as Take That but it was a fun night. There was plenty of this. The conference went well. I spoke on the topic of ethnic diversity, which made me very nervous (a lot of people have Opinions) and I was also quite freaked out by the number of people who seemed very excited to meet me. The words 'idol' and 'fangirling' were thrown around. I was uncomfortable. I literally just turn up, teach and sometimes write/speak about it - I've just been doing it for a long time. But it was really nice that people were so friendly and my talk went down really well, so that was good. I got a lot of love online and almost no criticism so I am going to chalk that up as a success. Last week I went to a lecture and out to dinner with my friend Vanessa, who I work for at the exam board. Always an interesting evening. She's one of those people that makes me think really hard about things. This weekend we've had a two-day exam board meeting online. There are definite negatives to doing it this way but the positives are that I got a lie in on Friday and I got loads of chores done - washing, bed stripping, shopping, grass mown, hallway tidied and hoovered, kitchen clean. Just think how nice it would be if I worked from home all the time. I've finally watched Fleabag, at least the first series. Since I loved Killing Eve so much and it was written by Phoebe Waller-Bridger (Bridger-Waller?) I thought I should watch the series she wrote from scratch. It is very, very funny, whilst at the same time being quite tragic. Her relationship with her stepmother reminds me of my relationship with Father Hand's second wife, who never forgave me for running up a gigantic phone bill when I stayed at her house. Not much reading has been happening. I've been too busy with the knitting. 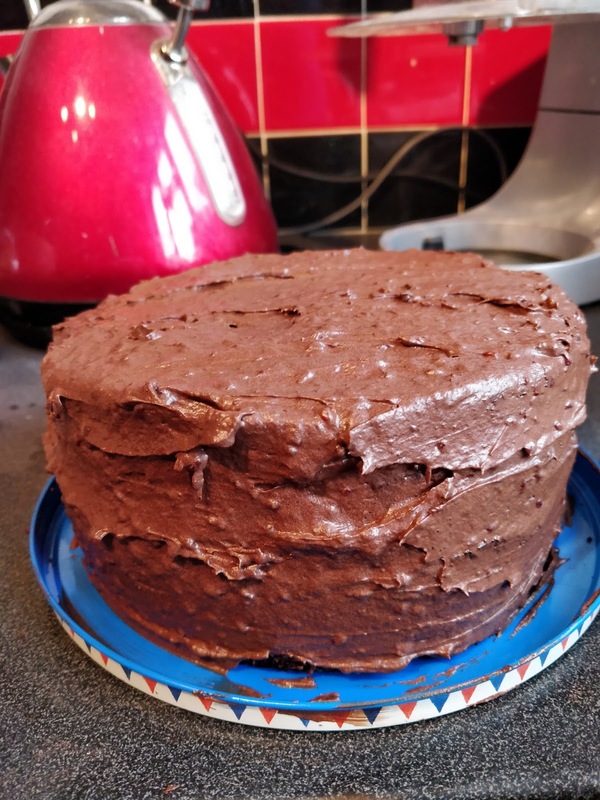 Elaine, a colleague at work, has decided to go vegan for the good of the planet, so I made an effort to provide a vegan cake last week. 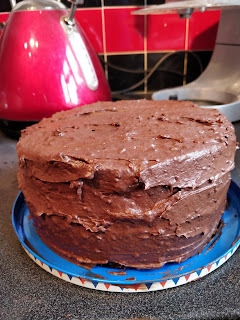 I used this recipe, purportedly the best vegan chocolate cake recipe. It was very good. You wouldn't have guessed it was vegan. I used Trex instead of butter but I also bought some Stork, which I will try next time. The buttercream was missing something but now I think about it, I wonder if that might have been a little salt - I usually use some salted butter in buttercream, alongside unsalted, usually because it's what I've got most of hanging around. It looks lumpy in the picture but that's because I spread raspberry jam in the middle and mixed some more into the buttercream. Elaine likes raspberries and my attempt at quick homemade cheery jam ended up a smoky mess on the stove when I got distracted by an email. Next I'm planning to try an Earl Grey and lemon vegan cake. I'm keen to try something using chick pea juice. Pretty good, considering I'm staring down my 13th work week in a row. 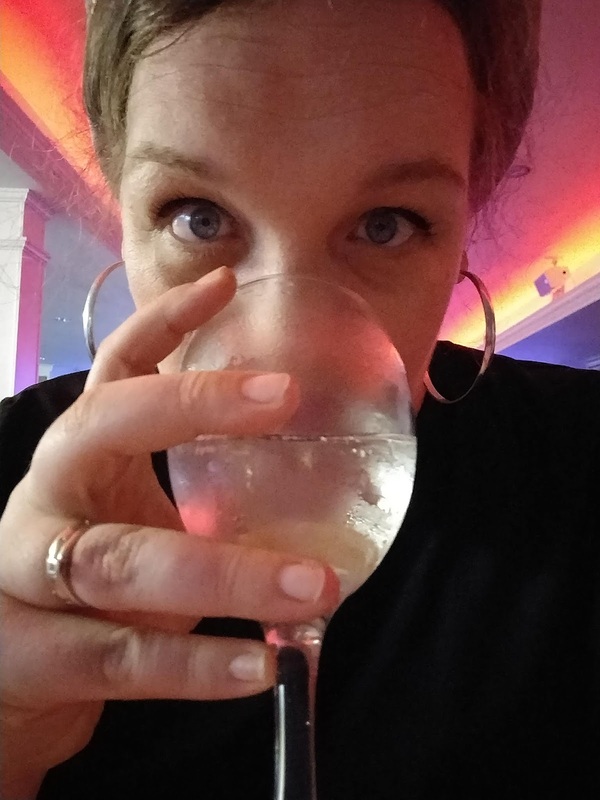 I've got some amazing things coming up at Easter - next weekend I'll be in London on a teacher fellowship and the weekend after I'll be in Alabama on a free review trip. I can't believe my luck. Then it's only five short weeks until half term, with two of those being four-day weeks, and then it's basically the summer holidays. Right? Just that pesky little exam marking job in between. Lordy. I hope it is a bit easier this summer. The portents are positive.